To ensure yourself a healthy sleep, use our professional mattress cleaning services. Around one third of our life we spend sleeping, so keeping a well cleaned and disinfected mattress is very important. Most health problems arise from a badly maintained mattresses and beddings. Our mattress cleaning service ensures a fully cleansed beds. We can remove the stains, pet dander, spills, mites and other microbes, which are likely to be found on your mattress. All bacteria, which may cause you irritations and health complications will be eliminated from your mattresses. We will remove all dust mites and spider mites from your mattresses, which can be potentially dangerous. 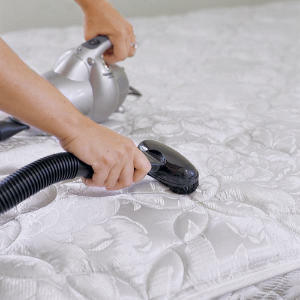 The steam cleaning we provide will fully disinfect your mattress. Fatigue, coughing, headaches and asthma are all health problems, which show that you need professional mattress cleaning. If you use our company for taking care of the clean condition of your mattresses, you will be have a wonderfully clean and thoroughly sanitized beds. Use our mattress cleaning services for providing yourself a flawlessly clean mattress. The microbes and mites on your mattresses may be invisible, but the health problems they will cause you will disturb you constantly. You can solve the problem by ordering our mattress cleaning service. Our cleaning staff is supplied with the most modern and powerful steam cleaning machines and equipment for professional mattress cleaning. The cleaners have many years experience in cleaning different kinds of mattresses. Whatever type of mattress you might have, you can be sure we will clean it, without leaving any damage to it. The cleaning solutions and detergents our personnel uses are entirely eco-friendly and non-toxic. They won’t cause you allergies, health problems or affect the health of your pets negatively. Use our mattress cleaning services to receive immaculately clean and spotless mattresses on inexpensive price. Call our contact numbers to get in touch with our phone operators. They can give you additional information on the mattress cleaning services we offer. We work seven days a week, without charging additionally when working in the weekends.